Some men who killed an Uber driver and stole his car have been nabbed by policemen in Lagos. 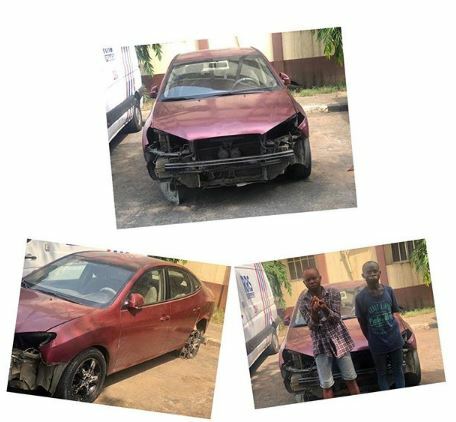 The operatives of Rapid Response Squad (RRS) have arrested two suspected robbers for killing a UBER driver and stealing his Hyundai Elantra car. Investigations by the police revealed that Robert, an ex-convict and a bus conductor, in the company of three others, now at large, had three days before his arrest, conspired to hijack a UBER car and sell it off. On the said day, the quartet: Emma, David, Dolapo, and Robert, at around 11:00 p.m, waved down the deceased, Sunday Obasi, in Lekki, and told him they were going to Ikate and he charged them N1,000. Before getting to their destination, the suspects told the driver that they wanted to ease themselves. It was at this point they descended on the driver. They killed him and pushed him off the car into the road before driving the car to Beach Road, where they hid it for two days while looking for a buyer. "He noticed that the driver was operating offline before deciding that we hijack the car from him. We contacted Archibong to assist us in disposing of the car. The buyers we invited indicated that they can only buy the car parts.